Retail-focused Retrocom Real Estate Investment Trust (RMM.UN-T) is reducing its annualized distribution from 45 cents to 30 cents per unit and changing its name to OneREIT. The new distribution would represent a funds from operations payout ratio of 70.8 per cent, compared to 106.1 per cent as reflected in the REIT’s first-quarter reporting. It would represent a yield of 8.3 per cent based on the June 16 closing price of Retrocom’s units on the Toronto Stock Exchange. “The board has decided to reduce the distribution to a level that is in line with the payout ratio of the Canadian REIT sector,” Retrocom president and chief executive officer Richard Michaeloff said in a release. The REIT has undergone a major repositioning, growing from 23 properties with 4.3 million square feet to 59 properties with 7.5 million square feet over the past five years. It has invested more than $100 million in improving the quality of its assets during the same period. 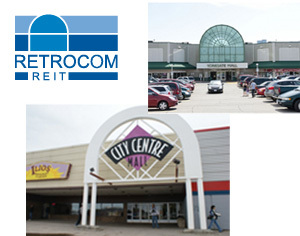 Retrocom’s asset base has increased from approximately $300 million to $1.2 billion. Its tenant profile has significantly improved in quality, with Walmart as the largest tenant. The REIT’s board believes the efforts and quality of this repositioning haven’t been reflected in the current unit price. Retrocom has $42 million in active development underway to further improve its portfolio. A $30-million redevelopment of its Golden Mile Shopping Centre in Regina, which will be anchored by a new 92,000-square-foot Real Canadian Superstore, has begun. The proposed name change to OneREIT remains subject to regulatory approval and is expected to take place in the coming months.